You know when you have found the perfect recliner. Not only will it seem like it was designed specifically for your comfort, it will also look great in your home. Your ideal recliner is durable, long lasting, and easy to clean, and of course it is affordable. If you think this describes your perfect recliner keep reading to learn more about the Tucker Camel Recliner, which is one of the best recliners available. 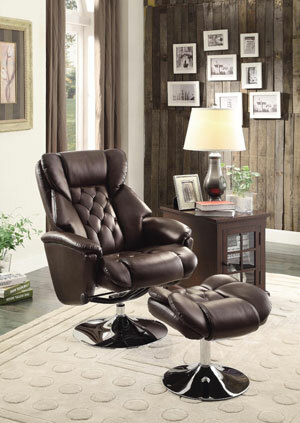 One of the first things you’ll notice about the Tucker Camel recliner is its plush and comfortable appearance. The foam stuffing in the seat, back, and arms, lets you sink into cushioned comfort, while the pull strings help to support and ease lower back pain and tension. The back of the chair is reinforced with steel, for long lasting support and comfort. The plush microfiber material is not only great to sit on it is also easy to clean, and resistant to most stains. The frame of the recliner is constructed from Asian hardwood and steel, and also features a soft kick reclining mechanism. There are three reclining positions that are designed to give you comfort and support, no matter how sore and tired you are. In the first reclining option, the leg rest is not extended. The back is in its normal position, which is a 110 degree angle that is ideal for watching TV, reading, or relaxing with friends and family. The seat height measures 17 inches when you are in the normal sitting position. In the second reclining option you can ease muscle tension and fatigue in your lower legs by extending the leg rest, while still keeping the chair back in place. This gives you a cushioned seat that measures 20 inches deep and a cozy 15 inches wide. For power naps or simply relaxing after a long day the third reclining position has the chair reclined back at a 150 degree angle. With a seat that measures 38 inches wide and 37 inches deep, you have plenty of room to relax and unwind in this amazingly comfortable chair. 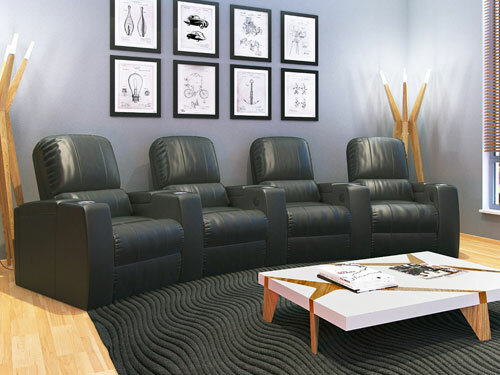 With three reclining options it is difficult to not find a comfortable position in this chair. The discretely placed reclining mechanism is easy to pull and does not distract from the chair’s appearance. 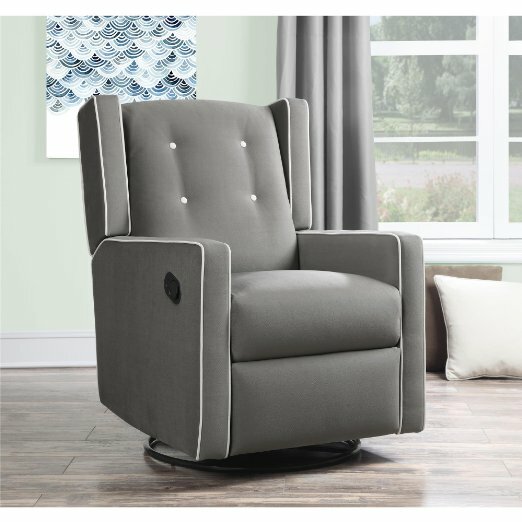 The Tucker Camel recliner is also easy to assemble without requiring additional tools, and includes complete instructions. The recliner is lightweight and is designed to blend into any home décor, with its rich camel coloring. The compact design makes it ideal for smaller homes, and you can easily match it with any of your existing furniture. 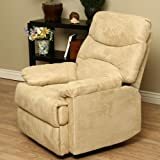 The superior lumbar support can help relieve your back pain, and the easy reclining mechanism is great for seniors and anyone with weak knees. 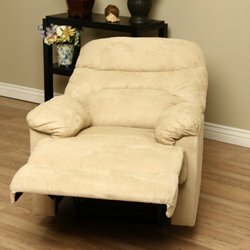 Ease chronic back and leg pain, or simply treat yourself to a comfortable and stylish reclining chair with the Tucker Camel Recliner. Constructed from durable microfiber material, steel, and Asian hardwood. 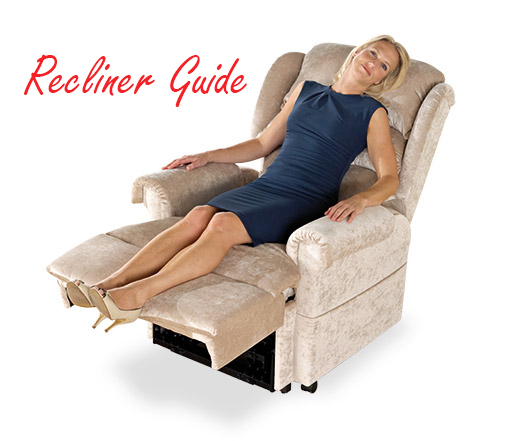 There are three different reclining options to ease back and leg pain, and give you amazing support. 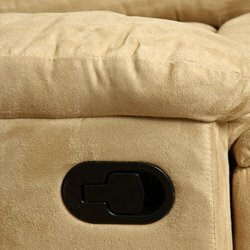 A soft kick reclining mechanism that is easy to use, even if you suffer from weak knees. The camel coloring blends into any home décor, and features a design that will never go out of style. 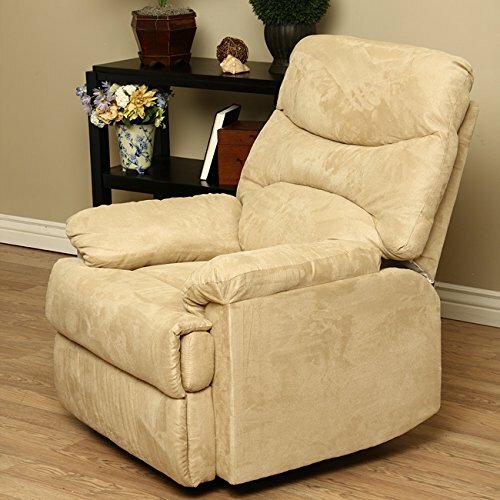 The Tucker Camel recliner is easy to assemble without using additional tools.